Wind and rough seas are impeding efforts to free a young humpback whale from a tangle of heavy rope wrapped around its mouth and body. 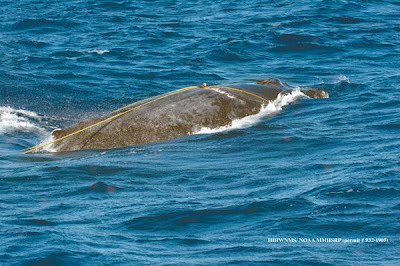 Rescuers tried for a second day Wednesday to free a young humpback whale tangled in rope, and while they enjoyed some success in removing hundreds of feet line, the remaining rope still posed a threat to the animal's life. NOAA's Hawaiian Islands Humpback Whale National Marine Sanctuary is seeking to fill eight primary seats and eight alternate seats on its advisory council. President Obama is expected to vacation in Hawai'i later this month, a holiday tradition for the president and his family. Hawai'i residents have registered guns at a record pace for each of the past four years, and appear headed for a new high again this year, preliminary figures show. The state Board of Education last night declined to ask for an emergency $12 million for student transportation, which means public schools could run out of money to pay for school bus service by April. Man lying on side of road dead after apparently being run over by driver pulling to the side as police cars respond. A city prosecutor said he will ask the state parole board to require a man and woman who nearly starved their 12-year-old daughter to death to serve 50 years in prison before they are eligible for parole. Swine flu activity is "somewhat elevated" for this time of year in Hawaii, state health officials say, but it is not rising and the islands possibly can avoid the pandemic upsurge that occurred on the mainland. The mystery of the "hot spot" that created the Hawaiian Island chain over the last 75 million years has been unraveled with an experiment that "opened a window into the earth." Kalihi-Palama Health Center has a new shipment of H1N1 vaccine. It won't be around for long. The county has no intention of implementing a pay-as-you-throw fee at solid waste transfer stations in the near future, Mayor Billy Kenoi said Wednesday. The Hawaii County Council doesn't want the state Land Use Commission dissolved after all. Two pit bulls belonging to a Kawaihae family were euthanized 48 hours after the dogs ripped open the throat of a neighbor's Labrador retriever and were deemed dangerous, said Lynette Fluaitt, director of operations with the Hawaii Island Humane Society. With home construction at a near standstill, Maui County will - and must - make some changes to its controversial residential work force housing policy, Council Member Wayne Nishiki said Wednesday. Charred wood and melted glass is all that remains of about one third of the northern portion of the former retail annex to the world-famous Coco Palms after a Thursday morning blaze further decimated a once-iconic hotel already in disrepair for years. A federal appeals court ruled Tuesday there was no basis for claims of discrimination and conspiracy made by former Kaua‘i Police Department Chief K.C. Lum against several county officials, upholding a lower court’s decision.